It will be our qualified staff and design consultants that will work you to according to the requirements you specify for the hanger. 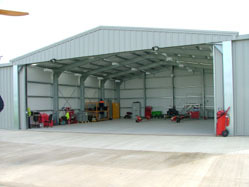 Additionally, we will help optimise space in your hanger to give maximum value for your money. The combination of our tensile steel which reduces cost without sacrificing quality, design optimisations, and timely delivery will result in cost savings. Once the design is made, we can provide you with the materials to build the hangar or we can handle the build from the base to the hangar itself according as you the customer select. This entry was posted in Steel Buildings and tagged air, bespoke, buildings, craft, hangers, pembs, steel by admin. Bookmark the permalink. What is a PIR Panel?